Today the press is referring to it as the Boone Theater. But that was its second name. It opened in 1924 as the New Rialto. When I was in there, in the 1980s, we called it the Armory Building, for its last use before the Mutual Musicians Foundation bought it from the city for a buck. The building at 1701 E. 18th Street, the southeast corner of 18th and Highland in Kansas City's historic jazz district, was in the news a couple weeks back. It won a National Endowment of the Arts award of $200,000 to “support the predevelopment, design and community planning phases” of restoring it as the home for Folk Alliance International. Restoration will require raising $2.5 million (the press release is here). It’s not the first time the National Endowment for the Arts has given money to bring the Boone back to life. NEA Project Number R80-42-76 in 1979 paid for a study which concluded the building could become the KC Jazz Center for, back then, $583,128.00. Money which nobody ever raised. So good luck with that two-and-a-half million. But let’s start further back than 1979. Let’s start in 1924, when the building opened as the New Rialto. In 1929 it was renamed the New Boone Theater for John W. “Blind” Boone, a then-famous black child pianist and composer, a prodigy from Missouri who died in 1927. In 1949 it was remodeled and became Scotts Theater Restaurant and Show Bar. Scotts was home to movies, music, drink and food, and a theater where the Orpheum Circuit booked touring acts. Sometime in the 1950s Scotts closed and the building was acquired by the State of Missouri and converted to a National Guard Armory. It was home to the 242nd Engineering Battalion, an all-black unit. The 242nd disbanded in 1960, when the segregation ended in Missouri’s National Guard. A few years later the city bought the building from the state for a dollar and used it as storage for the Public Works Department. 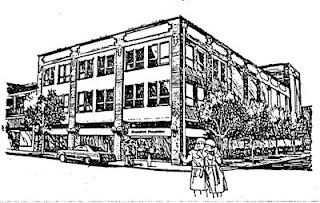 In 1977, the city sold the by then deteriorated building to the Mutual Musicians Foundation (MMF), recouping their dollar. The Foundation worked with the Black Economic Union (BEU) on a plan to rehab the structure as a Jazz and Cultural Center. “The idea of a Jazz Center in the Armory Building in the 18th and Vine area has been a dream and an important part of the overall development plan for many years. There has always been the hope that we could provide space to present jazz music, community classes, drama performances and an artists’ gallery. To provide a theater which truly serves the community, we will need to find income generators which will offset the high operating costs of such a project. Though we plan to find grant funds or private donations to renovate the building, we hope to be independent of public funds for day-to-day operations. 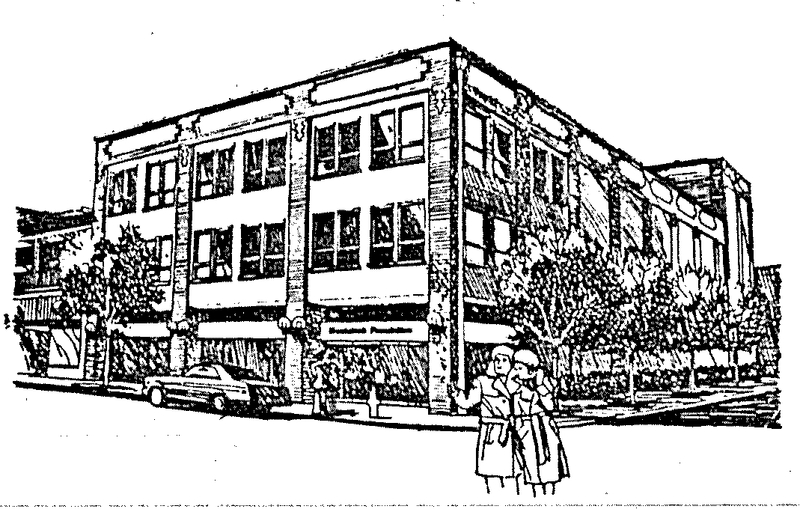 How a renovated building would have looked in 1979. The plan foresaw a music hall, a Kansas City Jazz Hall of Fame and Gallery in the lobby, and a music store on the first floor. The second and third floors would hold a rehearsal space, offices for MMF, and a jazz radio station. A three page budget detailed how all this could be done. I was in the Armory Building in the 1980s, while helping set up an 18th and Vine Festival, carrying tables and chairs stored there to the festival grounds. I don’t know when the Mutual Musicians Foundation gave up on the Armory, but I’m told it no longer owns the building. 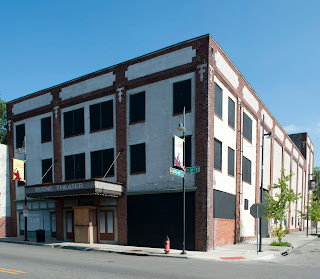 Now the Folk Alliance International wants to move from Memphis into the New Rialto/Boone Theater/Scotts Theater/Armory Building. Thirty two years ago its renovation was envisioned as the catalyst for revitalizing Highland Avenue. Heck, the city is still trying to turn the Rochester Hotel on Highland into residential units. And today, renovating the New Rialto/Boone Theater/Scotts Theater/Armory Building is only going to cost about two million dollars more than it would have cost in 1979. 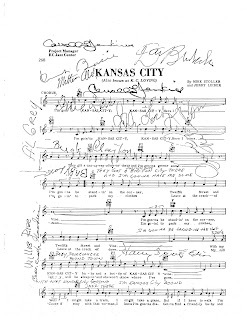 One of the most interesting parts of the 1979 study is the sheet music reproduced on the last page. I’ve scanned it. 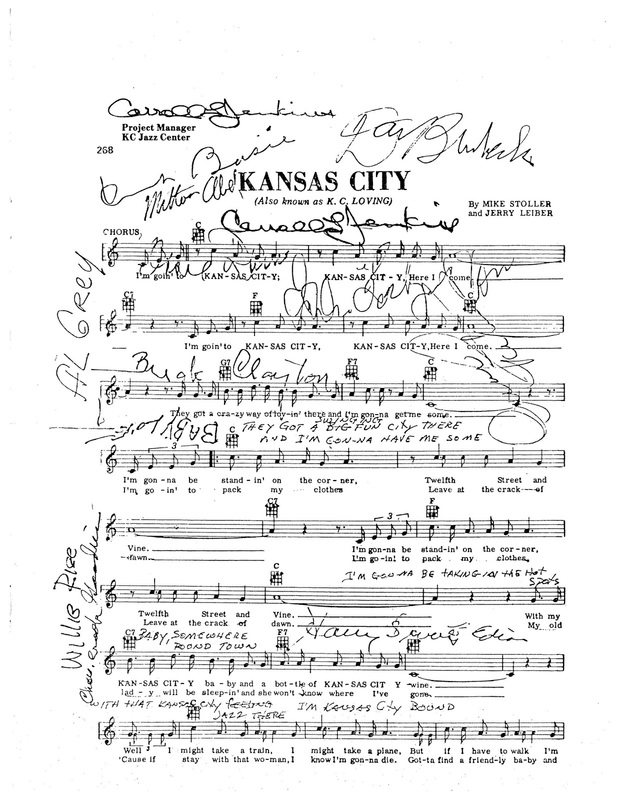 How many of these signatures can you identify? And I didn't realize the song Kansas City had a second verse. Its brow furrowed, its wings folded tight against its back, it frowned with frustration. Click again, maybe something will come up this time, it thought. It went back, then clicked the link again. But only a bright white screen stared back, blank. Every city, as you no doubt know, has its Magic Jazz Fairy, a mystical being who knows about all jazz in a city and silently flies around at night, and whispers into the ear of every jazz fan when and where to find jazz, so we wake up knowing, just knowing. Magic Jazz Fairies must exist, because how else could promoters who fail to promote jazz events expect people to show up? Those sly promoters. We think they sometimes don’t even try to draw a crowd. But they know about the Magic Jazz Fairy. They know the Magic Jazz Fairy will tell everyone. They know that a Magic Jazz Fairy exists – what other reasonable explanation is there for their lack of promotion? – and that’s all the proof anyone should require that it does. I’ve written before about Kansas City’s Magic Jazz Fairy (here and here). Sadly, ours has faced personal demons and slacked off in its job, and when it did, word failed to get out on jazz events, and attendance dissipated. There’s the real reason for the decline of jazz in Kansas City: our Magic Jazz Fairy drank too much. But our Magic Jazz Fairy, as told in an earlier post, feels a sense of responsibility, and it sobered up. And, despite temptations to drink again, it has remained a jazz whisperer. But sometimes, those promoters do not make its job easy. The Magic Jazz Fairy stared at the screen, not sure what to do next. There’s the kind of promotion any Magic Jazz Fairy welcomes. And right at the top of the web page, a link which reads, “Live Jazz Calendar / Special Events.” A Live Jazz Calendar on the web site. All you need to do is click that link to find out which one of “the area's best live jazz musicians” will be entertaining at that steakhouse that night with no cover charge. What more could one ask? One could ask for there to actually be a calendar when you click the link. For the third consecutive month, when you click it, there is no calendar. Instead, you’re served up a blank screen. Then there’s that other challenge in attracting a jazz audience in Kansas City, food. Not at the steakhouse. There, the food is excellent. And at a Plaza area jazz club, the online calendar is excellent, maintained flawlessly. But at that Plaza club, the food, well, there’s a challenge. The Magic Jazz Fairy tried the cuisine itself, twice. First time, brisket sliders sounded good. But when the plate of three arrived, they were dry and bland, and one was fatty. So the next time it tried the chicken mini-tacos. Again, a plate of three was served. But the soft tortillas of every one of them fell apart, spilling contents in an unappetizing mess all over its hands. This for mini-tacos which work out to five dollars a piece. For pity’s sake, the Magic Jazz Fairy thought, I’m no food critic, but I know a nice restaurant in the Crossroads where I can find mini-tacos for two dollars each which don’t fall apart. That’s the competition for this type of meal. The Magic Jazz Fairy knew of patrons who wanted to hear jazz with their dinner, but wanted a good meal, too, so they went elsewhere. It even heard of musicians recommending to their fans to eat first then come and sit at the bar of the Plaza area club for the jazz. The Magic Jazz Fairy despaired. How could it do its job? How could it help bring people to jazz? One club is promoting a blank screen instead of its music product. Another is discouraging supporters with its non-music product. It had to stay silent, the Magic Jazz Fairy decided. It would continue to fly throughout Kansas City and whisper to jazz fans about upcoming jazz shows and not share how it felt. The other matters might gnaw at it, but don’t do anything stupid, it thought, like posting the issues Kansas City jazz fans were discussing among themselves in a blog where someone else might find out. The Magic Jazz Fairy sat in front of its computer. Then, almost on a whim, it typed into its browser CareerBuilder.com. Best to keep its job options open, the Magic Jazz Fairy thought. Just in case.